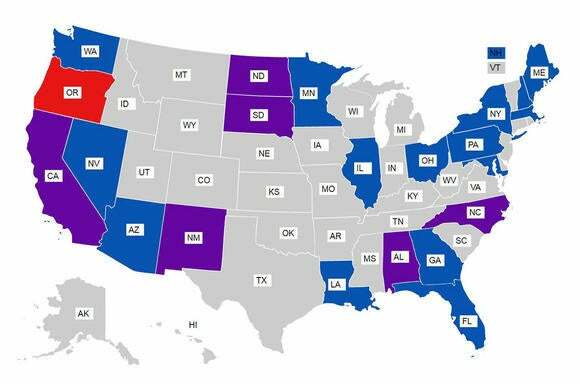 Not just one phone: The ACLU has compiled a map of every state where tech companies are being compelled to hack a mobile device in the name of the All Writs Act. The FBI was able to crack Syed Farook’s iPhone, but the overall fight against encryption is far from over. On Wednesday, the American Civil Liberties Union released an interactive map plotting all of the instances where the government has compelled Apple and Google to unlock a mobile device. Like in the now-vacated San Bernardino case, the ACLU found that government has been trying to use the All Writs Act since 2008 to force these companies to provide assistance in cracking their customers’ phones. You can check out the interactive map below. The ACLU was able to track at least 76 confirmed cases in 22 states where the government applied for an order under the All Writs Act. In addition, Apple has identified 12 pending cases in its court documents, and the ACLU has found one additional case in Massachusetts, although that one remains unconfirmed because of lack of publicly available information. “The FBI wants you to think that it will use the All Writs Act only in extraordinary cases to force tech companies to assist in the unlocking of phones. Turns out, these kinds of orders have actually become quite ordinary,” wrote Eliza Sweren-Becker, an attorney for the ACLU. While most orders are against Apple, some orders are against Google, too. In six states—California, New Mexico, North Dakota, South Dakota, South Carolina, and Alabama—the government has applied for orders against both tech companies. According to the ACLU, most of the cases seemed to stem from investigations relating to drug crimes. The map also shows which government agency was responsible for the investigation that led to the order. Unsurprisingly, most investigations were conducted by the FBI, but the map shows a few cases brought on by investigations from the Department of Homeland Security and the Secret Service. Why this matters: This map is visual proof against the government’s argument that this case was about one iPhone. And it goes to show that even though the San Bernardino case has been vacated, Apple and Google may still have a long fight ahead of them under the All Writs Act.